Does your child take an immense interest in plant life? Are you thinking about a fun and entertaining way to teach children about cactus? Well, look no further. 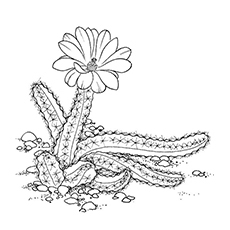 Our cactus coloring pages will acquaint your little botanist with the different types of cacti while honing his coloring abilities. Cactus is the only plant that can live in arid climates like the desert. Bearing the scorching and intense heat, this plant loses its leaves, retaining only the thorns. This fascinating plant comes in a variety of shapes and sizes, the common ones being the claret cup, the prickly pear, and the famous saguaro cacti. 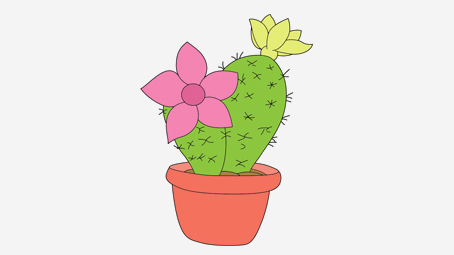 Given below is a small collection of realistic and animated cactus coloring pictures. These coloring pages will help your little artist understand the plants and its features a bit better. 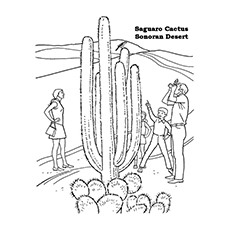 This cactus coloring page shows a group of children admiring a tall saguaro plant in the Sonoran desert. The saguaro cactus is the tallest species of cactus in the world. You will see this cactus dominating the landscape of central and southern Arizona. It is a symbol of endurance in the arid landscapes of South and North America. The cactus produces beautiful white flowers in the spring. The coloring page will surely hold our child’s attention. 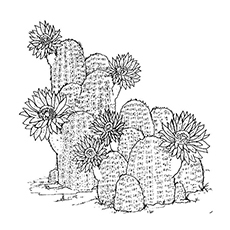 The claret cup coloring page implies that cacti are not thorny and dull green but have some bright flowers too! The Claret Cup is a species of the hedgehog cactus. The cactus is native to the northern Mexico and Southwestern U.S.
Ouch! That must be hurting. 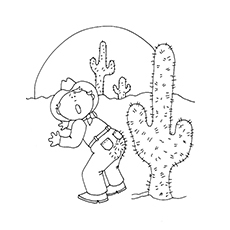 Here’s a funny coloring image of a cowboy and a cactus plant. The Sonoran desert was the most common region of the Cowboys. This coloring page is ideal for children who are intrigued by the mystique world of the Wild West. 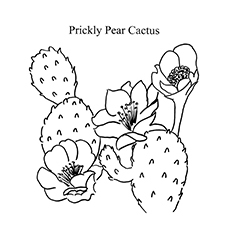 Here is a magnificent prickly pear cactus coloring sheet. 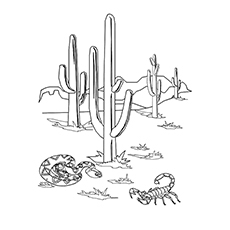 It’s the best coloring page to introduce your child to this desert dwelling plant. The prickly pear grows beautiful flowers and juicy fruits. And yes, the fruits are edible too. 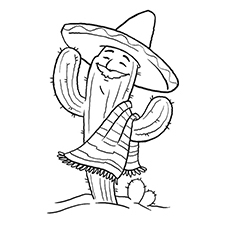 The coloring page shows Mr. Cactus all decked up to attend Cinco De Mayo. Cinco de Mayo is a festival celebrated every year on 5th May, in Mexico. The day commemorates the Mexican army’s victory over the French at the Puebla Battle. The festival is a celebration of the Mexican heritage and culture. It includes parades, street fest, and music performances. 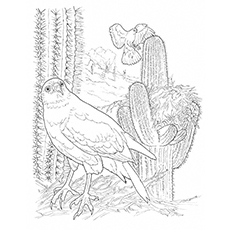 The coloring page features a realistic image of a Harris hawk and cacti. The Harris hawk is a common sight in the Sonoran Desert. And Sonoran desert, as we all know, has a broad range of cacti. It poses a problem for the Hawks. The animals on which these birds prey, hide under the cactus spines to protect themselves. Peanut cactus, also called the Echinopsis chamaecereus, is one of the rare species of the plant. The plant has long stems intertwined with each other. The peanut cactus bears beautiful, orange flowers, which appear during the spring season. Here’s a coloring image of a Peruvian apple cactus plant. It is a large, thorny and erect plant native to South America. The lovely cactus plant produces while flowering during the summers. And its bluish green stem reaches up to 10 meters in height. The Cactus opens every night once it matures, making a beautiful sight. Here’s a creepy coloring a saguaro cactus, a snake, and scorpion. Cactus, in general, is a drought-tolerant plant. Its root structure is very close to the surface. So it collects whatever little water that falls from the sky. We feel that the scene is from the Arizonan desert as it features a rattlesnake. These snakes are native to the Arizonan desert. 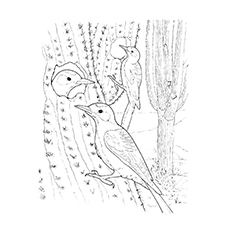 Here is a detailed cactus color page featuring Cactus Wren and its surroundings. The cactus wren is the state bird of Arizona. This bird makes its home inside the trunk of the cactus by burrowing holes. The cactus wren prefers the heat and sands of the desert. While your child is coloring, tell him about the different kinds of ecosystem in the world. 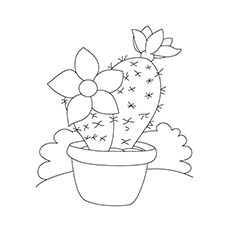 Download these cactus coloring pages right away to teach your little one about the cactus and its distinctive features. They are sure to have a great learning about this unconventional plant. Does your child like coloring the cactus plant? Tell us here.